You can read books about Chicago. You can watch movies about Chicago. But the only way to truly know Chicago is to know Chicago at 4 in the morning. That’s why we came up with this list of the 24 of the most notorious late-night haunts in the city. Some great, some terrible, all entertaining, all Chicago. Your job? To experience the city as only a true local can by hitting ALL 24 SPOTS by the end of the year. Stop freaking out and click HERE to see the whole map/checklist -- you’ve got work to do. 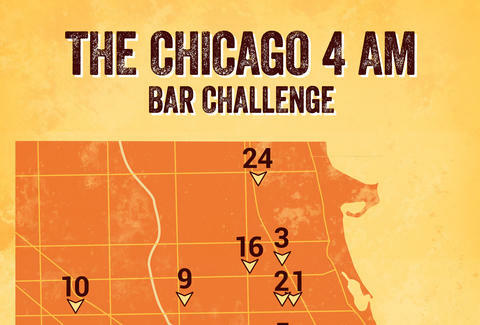 Oh, and keep us posted on your progress on Instagram with the #4amBarChallenge hashtag (the more scandalous, the better). See you out there, and Godspeed. Hours: Closed Mondays; Tuesdays, 10pm-4am; Wed-Fri, 5pm-4am; Saturdays, 5pm-5am. Bar features: Where to even begin? Jay Gentile is a Thrillist contributor and he has spent a lifetime doing this bar challenge. Buy him a beer @innerviewmag.